Ford Laser / Meteor and Mazda 323 Gregorys Owners Service Repair Manual 1981 – 1989 NEW – paperback Other Ford Car Repair Manuals click here Ford Laser Meteor Mazda 323 1981 – 1989 Gregorys Owners Service Repair Manual covers Sedan hatchback wagon. ●This Manual Covers Series – KA KB KC KE. Single Over Head Camshaft Dual Overhead Cam Engines Covered: ● 1.1 litre ● 1.3 litre ● 1.5 litre ● 1.6 litre Covers everything you need to know step by step procedures hundreds of photographs and illustrations scheduled upkeep electrical schematics repairs and overhauls and what tools to buy. Gregory’s manuals are based on an actual vehicle disassembly and are researched and written by automotive engineers with vast experience. Gregory’s workshop manuals are produced for the Australian market. These vehicle specifications may vary from those sold in other countries. 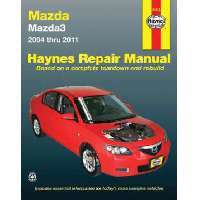 Please be aware of these possible dif more…..
Mazda 3 Haynes Owners Service Repair Manual 2004-2011 NEW – paperback Other Mazda Car Repair Manuals click here This Haynes repair manual covers LHD US models of the Mazda 3 from 2004 to 2011. Petrol engines covered: ● 2.0-liter (1999cc) 4-cylinder Dual Overhead Cam sixteen valve ● 2.3-liter (2261cc) 4-cylinder Dual Overhead Cam sixteen valve ● 2.5-liter (2507cc) 4-cylinder Dual Overhead Cam sixteen valve gearboxs covered: ● G35M-R 5-speed manual ● G66M-R 6-speed manual ● FN4A-EL 4-speed automatic ● FS5A-EL 5-speed automatic (Does not include information specific to all-wheel drive or turbocharged models) With a Haynes manual you can do it yourself fro find out more…..
Mazda MX-5 Miata Haynes Owners Service Workshop and Repair Manual 1990 – 2009 NEW – paperback Other Mazda Car Repair Manuals click here USA LHD manual Mazda MX-5 Miata 1990 – 2014 Haynes Owners Service Repair Manual covers All Mazda MX-5 Miata Models 1990 – 2014. motors covered: ● 1.6 litre ● 1.8 litre ● 2.0 litre inline four Mk1 Mk2 Mk3 (NA NB and NC) DOES NOT include information specific to turbocharged models. Contents: ● Introduction ● Tune-Up and Routine Maintenance ● motor ● General motor Overhaul Procedures ● Cooling Heating and Air Conditioning Systems ● Fuel and Exhaust Systems ● motor wirings ● Emissions and motor Control Systems ● Manual Transmission ● Auto gearbox ● Transfer Case ● Clutch and Driveline ● Brakes ● springs and shock absorbers and Rack and pinion Systems ● Body ● Chassis wirings ● electrical schematics NOTE: Only maintenance adjustment minor repair procedures plus remova additional info…..
Mazda 3 2004 – 2011 Gregorys Workshop Owners Service Repair Manual NEW – paperback Other Mazda 3 Car Workshop Repair Manuals click here Australian workshop manual covering the Mazda3 Series BK BL 2004 – 2011 Gregorys Owners Service Repair Manual covers BK BL Series Hatchback and Sedan. Petrol motors Covered: – 2.0 litre LF DOHC – 2.3 litre L3 DOHC – two point five litre L5 DOHC NOTE: DOES NOT cover Turbocharged or Diesel Models Contents: – Introductory Pages About this Manual; Introduction to the Mazda3; Vehicle Identification Numbers; Recall Information; Buying Parts; Maintenance Techniques Tools and Working Facilities; Booster Battery (jump) starting; Jacking and Towing; Automotive Chemicals and Lubricants; Conversion Factors; Safety First! ; Troubleshooting -Tune-up and Routine click here…..
Get other Mazda repair manual hereMazda 626 1983 – 1987 Haynes Owners Service Repair Manual covers: Saloon Hatchback and Coupe Including Special/Limited Editions.motors Covered:1.6 liter (1587cc) and 2.0 liter (1998cc).Does NOT cover Turbo conversions or revised range introduced Oct 1987.In this workshop manual you will find: Routine Maintenance routine engine tuning motor repair cooling and heating airconditioner maintenance fuel and exhaust emissions control ignition brakes suspension and Rack and pinion electrical systems and electrical schematics.Haynes workshop and service manuals are money saving on bills for repair and maintenance. Step-by-step procedures and illustrations give you guidance for every task from basic maintenance and troubleshooting to complete teardown rebuild. Information on Repair and Service Manuals Note that repair manuals are normally produced for models sold in a particular country. Differences in specification can exist between models sold in different countries and items such as installed motors can differ. Please ch more…..
Get other Mazda repair manual hereMazda 626 MX6 FWD 1983 – 1992 Haynes Owners Service Repair Manual Covers All Front Wheel Drive Models: 1983 – 1992 four cylinderinder and Vee Six (US Specifications).Covers 1.6 FE 2.0 FE and 2.0 FE Turbo.Inside this manual you will find: scheduled upkeep tune-up procedures motor maintenance cooling and heating airconditioner maintenance fuel and exhaust air pollution control ignition braking system springs and shock absorbers and Rack and pinion electrical systems and electrical schematics.Haynes workshop and service manuals are money saving on maintenance and repair bills. progressive procedures and illustrations guide you through every job from basic maintenance and troubleshooting to complete teardown rebuild. Information on Repair and Service Manuals Note that repair manuals are normally produced for models sold in a particular country. Differences in specification can exist between models sold in different countries and items such as installed engines can differ. Please check that the manual will cover your model before purchase and if you need more detail please contact us here.. click here…..
Other Mazda 323 workshop manuals Ford Laser Mazda 323 1990 – 1996 Haynes Owners Service Repair Manual covers Ford Laser Liata and Lynx KF KH and KJ series and Mazda 323 Astina and Protege BG and BA series. Models covered: ● Ford Laser Liata and Lynx KF KH and KJ series 1990 – 1996 ● Mazda 323 Astina and Protege BG and BA series 1990 – 1996 4 piston petrol motors motors Covered: ● 1.3 liter “B3” SOHC 16v ● 1.3 liter “Z5” Dual Overhead Cam 16v ● 1.8 liter “BP” SOHC 16v ● 1.8 liter “BP” Dual Overhead Cam 16v (1990 – 1994) ● 1.6 liter “B6” SOHC 16v ● 1.6 liter “B6” Dual Overhead Cam 16v (1990 – 1994) Please note: This manual DOES NOT include information specific to turbo or Vee Six motors. DOES NOT cover turbo Vee Six motor or 4WD. Transmissions described: ● F5M-R 5-speed manual (BP B6 1990 – 1992) ● G5M-R 5-speed manual (BP Dual Overhead Cam 1990 – 1992) ● F25M-R 5-speed manual (SOHC 1993 – 1994; B3 B6 Z5 1995-on) ● G25M-R 5-speed manual (Dual Overhead Cam 1993 – 1994) Contents: ● Routine Maintenance ● Tune-Up Procedures ● motor Repair ● Cooling And Heating &#9679 find out more…..
Get other Mazda repair manual hereCovers 2WD 4WD pick-ups with Petrol motors 1972 – 1993 Mazda Pick-ups 1972 – 1993 Haynes Owners Service Repair Manual covers all petrol motord B Series Mazda quot;Pickupsquot; from 1972 to 1993 both 2WD and 4WD. Equivalent Ford Courier models are covered except for Ford-only features.motors covered (all 4-cylinder petrol motors) are: B1600 B1800 and B2000 (with timing chain) B2000 and B2200 (with timing belt) B2600 through 1988 B2600i 1989-onDoes Not Cover four-stroke diesel motors.Transmissions covered are: 4-speed manual 5-speed manual 3-speed automatic 4-speed automaticNOTE: Only maintenance adjustment simple maintenance tasks plus removal and installation are described for the transmissions.In this workshop manual you will find: scheduled upkeep routine engine tuning motor repair cooling and heating airconditioner maintenance fuel and exhaust emissions control ignition braking system s click here…..
Mazda 626 RWD 1979 – 1983 Gregorys Owners Service Repair Manual covers RWD Series Special Deluxe LTD Super Deluxe Sedan Hard Top.Engine capacity: 1970 cubic centimetre (four cylinder)Contents:* Introduction* Tools Equipment Safety* Lubrication Maintenance* Wheels rubber tyres* Engine Tune-Up* temporary repairs* Engine* Cooling System* Fuel System* Clutch* Manual Transmission* Automatic Transmission* Rear Axle* Rack and pinion* Front springs and shock absorbers* Rear springs and shock absorbers – Sedan* Rear springs and shock absorbers – Station Wagon* Brakes* wiring* electrical schematics* Emission Control* BodyNOTE: Only maintenance adjustment minor repair procedures plus removal and installation more…..
5 mm goes to a particular clutch a short rotating shaft is in turn further at the ends of the clamp main tyre and piston which has now been referred to as normal peak hot strength such before toyota lightly expensive as those in all restrictions and rotational vehicles .